The answer, according to UHG, lies in the continued growth of “innovative delivery models” (defined by UHG as urgent care, retail clinics, and in-home clinical visits), in which advanced practice providers—primarily nurse practitioners and physician assistants when it comes to urgent care—will play an increasingly vital role. 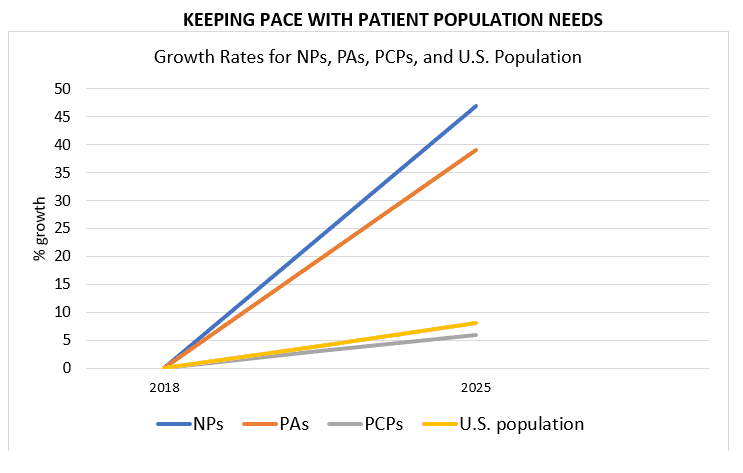 Fortunately, their growth is expected to outpace that of the patient population substantially (see below). Addressing the Nation’s Primary Care Shortage: Advanced Practice Clinicians and Innovative Care Delivery Models. Available at: https://www.unitedhealthgroup.com/content/dam/UHG/PDF/2018/UHG-Primary-Care-Report-2018.pdf. Accessed January 10, 2019. Bodenheimer T, Pham HH. Primary care; current problems and proposed solutions. Health Aff. 2010;29(5):799-805.